Originally written for the Vol.6-No.4 edition (August 23, 2012) of the Toyama Hot News e-newsletter. 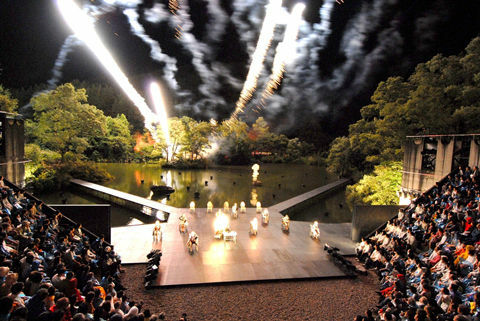 From Friday, August 24th through Sunday, September 2nd, SCOT Summer Season 2012 will be held at Toga Art Park in Nanto City. SCOT (Suzuki Company of Toga) is a theatre group led by Tadashi Suzuki and based in Toga, and will be performing King Lear, Greetings from the Edge of the Earth, and Cinderella. There will also be an experimental performance, Turandot: The Rise of Capitalism and the Decay of Common Sense, by young international actors who studied under the Suzuki Training Method. King Lear, based on Shakespeare’s play, is a representative work of Suzuki. The elderly main character whose family ties had collapsed can do nothing but wait for death alone in a hospital. This play illustrates the possibility that anyone, in any time or place, could have a fate of loneliness and madness like King Lear. Greetings from the Edge of the Earth premiered in 1991. This show takes advantage of the outdoor stage, and features magnificent fireworks against the grand nature of Toga. Cinderella is the first work by Suzuki aimed at families, and is a modern re-telling of the classic fairy tale. A young woman who loves to write plays is treated badly by her father and half-sisters, but she receives encouragement from a kind woman and writes a play based on Cinderella. This is a story that tells the importance of working hard and keeping your hopes and dreams alive. Turandot: The Rise of Capitalism and the Decay of Common Sense combines Puccini’s opera with traditional Italian masks. It has an Italian producer, and is performed by Chinese, Singaporean, Brazilian, Lithuanian, and Italian actors. SCOT was born when the original group relocated from Tokyo to a converted traditional thatched-roof house in Toga in 1976. In 1982, they held the first international theatre festival in Japan, the Toga Festival. SCOT quickly gained international attention, and Toga came to be considered the “holy land” of world theatre. Currently, based in Toga Art Park situated within the inspiring artistic atmosphere of Toga, SCOT is always working on new theatrical art works. Aside from the annual SCOT Summer Season, they also host the Toga Theatre Competition, which is known as a gateway for internationally active theatre producers.